We do not curently have theatre tickets available for Dinner at The Twits This could be because we have simply sold out or it could be that this show is no longer running. The information on this page remains purely for historical and informational purposes. Mr and Mrs Twit are having a dinner party and YOU are invited. Les Enfants Terribles theatre company and ebp, the creators of Olivier Award nominated ALICE’S ADVENTURES UNDERGROUND and THE GAME’S AFOOT, are for the first time creating one of Roald Dahl’s titles specifically for adults*, in collaboration with delicious gastronomy from Bompas & Parr and the creative wranglers at Creature of London. Join Mr & Mrs Twit in their windowless house and ghastly garden for an evening you will never forget. Your ticket includes the chance to fish the glass eye from your prickly cocktail apertif, hunt for concealed canapes and gruesome hors d’oeuvres, brave a baroque bird pie banquet and potentially perilous pudding, served with ½ bottle of wine or non-alcoholic drinks, all whilst experiencing 90 minutes of entertainment from the worst hosts ever before heading to Mr and Mrs Twit's Upside-Down Cocktail Cavern. *not for nasty, nosey little children. Latecomers will not be admitted. Please arrive 15 minutes before your start time. Dinner at The Twits is a fully integrated, immersive dining experience. During the 90 minute show, there will be gripping performance, complimented by a delicious banquet, lovingly prepared by Mr & Mrs Twit. You can also visit the bar after the performance has finished. Here, you can relax and have a drink, all in the comfort of Mr & Mrs Twits’ home. Dinner at The Twits has a running time of 90 minutes with no interval. Dinner at The Twits is recommended for audiences aged 16+, not for nasty, nosey little children. It is well known that the Twits dislike children. Their meal and their conversation has been specifically designed for adults. Children under 14 years old will not be admitted. Those between 14 and 16 can be admitted on the understanding that they do not smile, laugh, or play with the Twits’ exquisite food. And that they finish every scrap. Any person under 18 must be accompanied by an adult. The Twits are taking over The Vaults in Waterloo for their dinner party. To get to The Vaults, exit Waterloo station via Exit 1, next to Platform 1. Turn right out of Exit 1. Continue straight for 100m until you come to a set of stairs, walk down the stairs and turn right onto Leake Street, the graffiti tunnel. The Vaults will then be visible on your right hand side. Doors open for Dinner at The Twits 30 minutes before the start time. The Twits despise lateness at their parties. There are strictly no late admissions. We advise you arrive at least 30 minutes before your start time. No, you do not need to print your ticket. You must have a ticket to enter Dinner at The Twits, and we can accept a copy of your ticket digitally, on a device, or a print out. Will I be admitted if I forget my ticket? No, you will not be able to enter if you cannot present a ticket on arrival. If you have any issues on the day please visit our on-site box office with the card you purchased your tickets with at least 30 minutes before your performance time, to give us time to find and re-issue your ticket. Will all members of our party be sat together? Mr & Mrs Twit are currently designing their dinner party venue at the moment to ensure it is ready for your arrival. Further information on seating plans will be available shortly. Will I be able to leave the performance at any point? Mr & Mrs Twit will be highly offended if you leave in the middle of their dinner party. Therefore, they ask you take the necessary precautions and ensure you go to the bathroom beforehand. Mr & Mrs Twit will be extremely angry if you take pictures or film whilst at their dinner party. However, you will be able to take photos in the bar after seeing the show. Yes. Mr & Mrs Twit ask that all bags are checked in on arrival at their cloakroom. There is a small Twit’s Tax of £1 per item. Mr and Mrs Twit ask that their guests are dressed suitably in Dahlian glamour. No part of the show features anyone intentionally spilling anything on anyone else. Mr & Mrs Twit respect people's personal belongings. Mr & Mrs Twit will be serving up a set menu featuring some of their famous, speciality courses. This, and a 1/2 bottle of wine is included in the ticket price. Will special dietary requirements be catered for? We will be offering a vegetarian and vegan option. 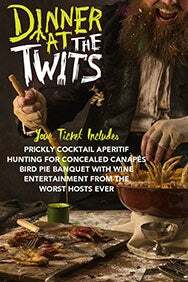 Once you have booked, please send your order number to info@twitsdinner.com and we will ensure that it is passed on to Mr & Mrs Twit so they know when preparing your banquet. Not all other dietary requirements can be catered for, we recommend that you contact us at info@twitsdinner.com before booking. Do the actors mess around with the audience’s food? No. Though the dinner party is being hosted by the hairiest, most disgusting and positively vulgar couple in the world, they are under firm instruction not to interfere with anyone’s food. Will I have a choice of meal? Mr and Mrs Twit are serving a set menu of the finest dishes made from the most special ingredients in their kitchen. Please inform us of any specific dietary requirements before the show, by emailing info@twitsdinner.com. Do you accept cash and card? We accept both cash and card. However, the Twits’ cloakroom only accepts cash. Are there any access performances? Unfortunately, due to the nature of the performance and the limitations of the venue we are unable to offer bespoke access performances or a free carer ticket arrangement. We regret that wheelchair access cannot be made available due to the limitations of the venue. No, the performance does not feature strobe lighting. Is it possible to attend the show without taking part in the meal? No, Mr and Mrs Twit would be very offended if you turned down their hospitality.